Ofcom statistics quote 91 per cent of the UK population is now using mobile telephones and 34 per cent of those with mobile phones use them to access the internet. Gartner has predicted that by 2013 80 per cent of businesses will support a workforce using tablets, and by 2014 almost all businesses will supply corporate data through smart-phone applications. So, does this mean that organisations are now considering utilizing mobile technology across all aspects of their business, including learning and development? Only 10 years ago the challenge for those deploying training via eLearning was PC and internet technologies, with screen resolution and broadband speed being two of the biggest hurdles. As users sought a more flexible work/life balance laptops were introduced. 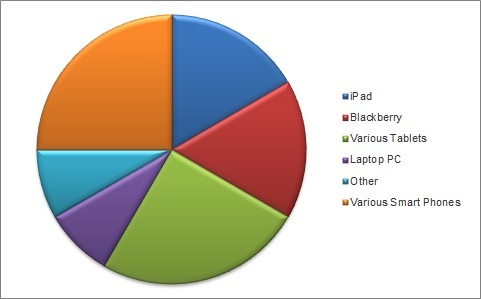 Laptops in turn brought their own complexities in terms of remote connection and security. As each of these barriers has been overcome, end users have benefited from the means to work anywhere; working from home or on the train has become the norm. Mobile Devices are now the latest ‘must have’. Organisations are seeking to maximise the business benefits and harness the enthusiasm of the user. The benefits of eLearning for the remote or mobile workforce are undeniable in terms of time and budget. With software vendors recognising the demand for all types of learning – IT Systems, Soft Skills and Compliance being just a few – we consider time is now right to consider Mobile Learning. Unfortunately, the expectation that the features and functions available on our laptop will somehow automatically be delivered to our mobile device is a misconception. This report outlines the findings of a Mobile Learning Survey undertaken by Larmer Brown to establish the perception of Mobile Learning amongst organisations in the United Kingdom. It looks at the perceived benefits of Mobile Learning as well as the potential barriers to implementation and explores when organisations might be in a position to implement a solution. 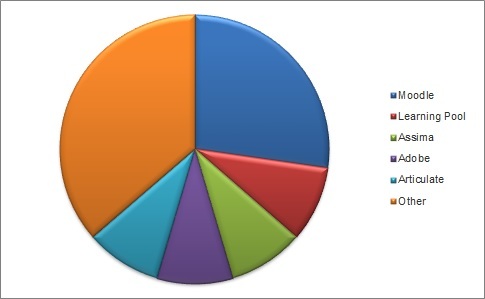 Data was gathered from a cross section of organisations across the UK between July and September 2012. A total of 155 respondents were questioned, each in a Training and Development position or representing this role within the business. There is still a large amount of uncertainty around Mobile Learning and what benefits it can offer. Many organisations are in need of more information in order to make a decision on when, or indeed if, they will implement a Mobile Learning solution. This is why Larmer Brown commissioned the Mobile Learning Survey. 85.2 per cent of organisations questioned have employees working away from the office; what we later refer to in this report as a ‘mobile workforce’. Mobile Learning Survey Respondents that confirmed they have employees working away from the office were asked if any specific training is provided for this mobile workforce. Respondents were able to provide multiple answers. Figure 1 shows that, although these organisations have the challenge of delivering learning to a workforce that is not office based by far the most common form of training delivery is the classroom, with eLearning coming in second place. Our research did not ask why organisations have this preference, although, as this was a multiple choice question we feel we can deduce that the classroom training is being delivered in combination with other methods. The Mobile Learning Survey asked this question of those organisations that do not have what they would consider to be a mobile workforce and therefore do not need to consider delivering training to employees that are not based in the office. Respondents were able to provide multiple answers. 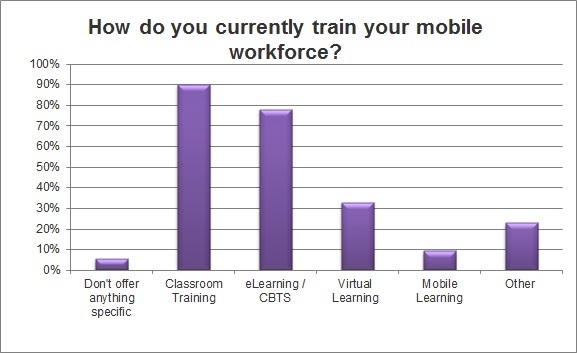 As you can see from Figure 2 of the Mobile Learning Survey, classroom training still remains the most common response. However, for organisations training only office-based staff, eLearning is a much closer comparison than those training a mobile workforce. Additional answers included face to face training, coaching and sourcing training material via the internet or other media. Is the time right to consider Mobile Learning? There was almost an even split on responses to this question within the Mobile Learning Survey, with 55.2 per cent of respondents feeling that it is not the right time to consider Mobile Learning, and 44.8 per cent responding positively. Later in this report we discuss the perceived barriers to implementing Mobile Learning, which could help us to understand why there is a low level of positive responses to this question. 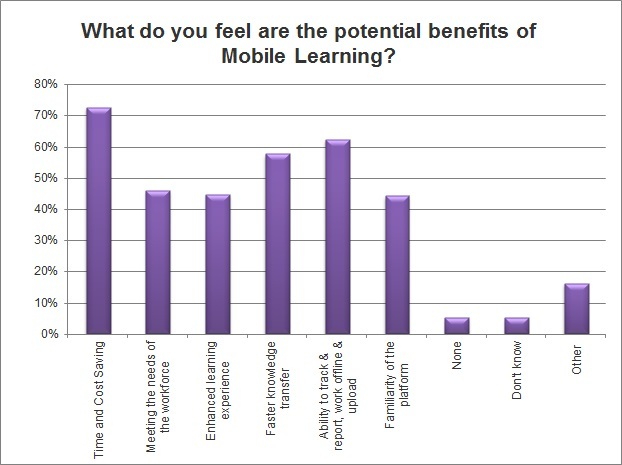 What are the perceived benefits of Mobile Learning? Given the responses to earlier questions around training delivery it is not surprising that time and cost saving is the most common perceived benefit of Mobile Learning. 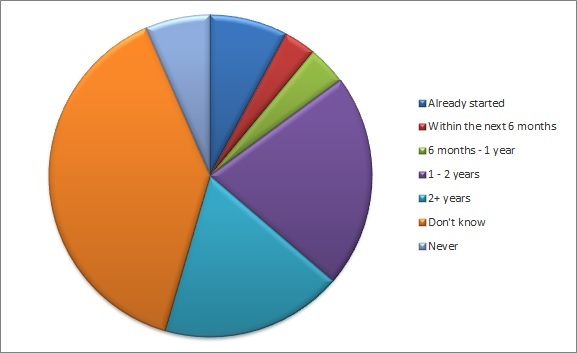 Respondents were also asked for the most important benefit. Again, time and cost saving came out on top with 24.7 per cent of Mobile Learning Survey Respondents voting this the most important. Faster knowledge transfer came a close second with 20.8 per cent. As you can see from Figure 4 in the Mobile Learning Survey, there are numerous perceived barriers to implementing Mobile Learning within an organisation, and if the benefits can outweigh the identified barriers then a solution can be reached. This was therefore a crucial question to truly understand the perception of Mobile Learning and why organisations may not feel that this is the right time to implement a solution. Mobile Learning Survey Respondents were able to provide multiple answers although the results did not identify any one barrier of outstanding importance or which was considered a major issue.